This project taught me quite a bit about how boats are lofted and built using a system of stations that define key cross sections. These stations are then joined and blended into a three-dimensional form using the lengthwise stringers. 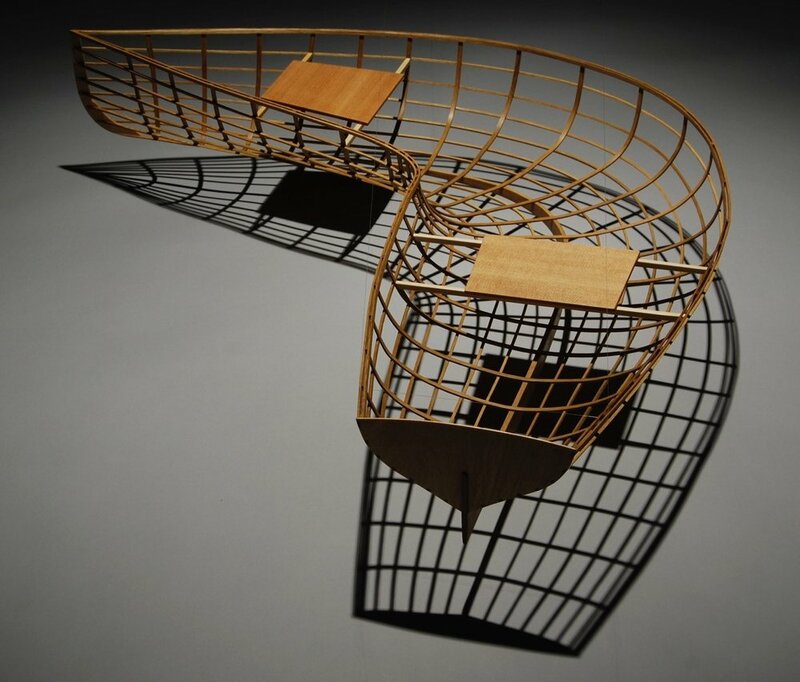 It is a very different way to generate three-dimensional volumes from most furniture-making techniques, and it is a wonderful way to develop compound forms where everything is curved in more than one direction. While the three of us were building the boats we talked about messing with the symmetrical nature of boats and making a boat that would just go in a circle or imply other modes of movement that fall well outside traditional nautical design formats. The Flotilla Project explores these ideas through conceptual models instead of real full-size boats. The seven pieces that make up the Flotilla Project are "proposals" for boats you would never want to build. Some of them suggest alternative means of locomotion through water. Instead of generating motion by applying external force from a motor or a sail or an oar, what if a boat could swim or screw its way through the water? Although these are nonfunctional sculptural forms, they are still looking at issues of function, or, perhaps more accurately, at dysfunction. Like much of my furniture work, they get their meaning from subverting or inverting functional ideas. The forms are all generated by using the same set of seven stations (really five stations plus the stem and the transom that define the two ends of the form) and then organizing the stations on different-shaped "platforms" (the boatbuilding term is strongback) to generate the new form. Mostly the parts are steam bent to achieve the sometimes quite sharply curved geometries. Ideally I like for the boats to be exhibited suspended with monofilament at about a three-foot height that implies a common water level among the various boats, so the viewers would feel as though they are walking waist deep in water. Born in Boston in 1956, Tom Loeser served as chair of the University of Wisconsin–Madison Department of Art from 2009 to 2014 and has been head of the wood/furniture area at UW–Madison since 1991. He holds a BA from Haverford College (1979), a BFA from Boston University’s Program in Artisanry (1983), and an MFA from the University of Massachusetts–Dartmouth (1992). Loeser designs and builds one-of-a-kind functional and dysfunctional objects that are often carved and painted and always draw inspiration from the history of design and object making. In 1993 he spent six months in Japan on an NEA Creative Artists Exchange Fellowship. In 2003 he spent six months teaching and researching in London. In 2010 he collaborated with his wife, Bird Ross, on the design and fabrication of the highly kid-friendly, interactive, and not at all traditional reception desk for the Madison Children’s Museum. In 2013, Loeser worked with willow furniture maker Dave Chapman to build three large willow and steel pod forms that are permanently installed as reading retreats in the children’s section of the new downtown public library in Madison, Wisconsin.